Pressure on your joints while working out can cause you to be in pain. If you're looking for a way to get your cardio workout in without causing your joints to hurt, then choosing an elliptical machine can be a better choice. Not only are they safe to use, but they also help you burn just as many calories as ellipticals, stationary bikes, and stair steppers. 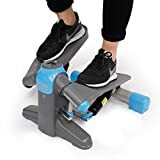 They give you the same range of motion as other cardio machines, but the only difference is that your joints don’t receive the same amount of pressure as when using a treadmill or a stationary bike. If you’re looking for a compact elliptical that can fit into small spaces, there are many on the market. Listed below are the three best ellipticals for small spaces. The Locktek is an excellent mini stepper that can allow you to burn the same amount of calories as other cardio methods. It’s small, compact, and very easy to move and store away. The dimensions of the unit are 17” x 16” x 11”. There is a weight capacity of 220 lbs, which can accommodate most body sizes. Located on the LCD display that keeps track of your progress will be your calories, time, count, and rep count. This can be used to keep track of your progress while you’re working out. This elliptical is great for those who want a very small and compact elliptical. It’s designed not to take up that much space, and unlike other models, this elliptical is very slim and not as bulky as other units can be. The LCD monitor is very small, but you can use it to keep track of all of your progress over the course of your workout. The unit is designed to keep up with intense workouts, so if you’re planning on using it frequently, it will last. The biggest downfall of this product is the fact that you can’t adjust the resistance. You can manually go faster or slower when you’re working out, but the resistance and tension will remain the same. So, it’s only recommended if you don’t plan to have a machine that can be adjusted. The iDeer elliptical is an under the desk workout machine that allows you to use it while sitting or standing. This makes it great for you to use in an office, or at home when you’re watching TV or doing other leisurely activities. The peddler is highly adjustable and is designed to give you multiple options of resistance. The multifunctional monitor has a built-in LCD display which will track your calories, count, distance, time, and total count. The pedals have a unique anti-slip grip which keeps you from slipping. The design of this peddler is super compact and easy to use. You can use it essentially in any room or setting. Use it in the office, at home, or even take it to the gym. The adjustable resistance allows you to change back and forth between light resistances and intense workouts. This gives you full control over everything. The LCD display is bright and easy to read, and this is great because you can see it when you’re using the machine. 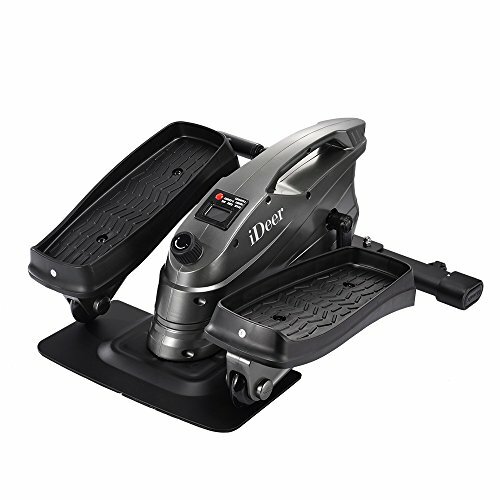 The anti-slip pedals keep you safe, and the whole unit is designed to be super quiet while in use. This way you can use it when you’re watching TV or in the office. The unit tends to tighten up from time to time. If this happens, then all you need to do is apply some oil to the machine, and it will function as it was intended to. You’ll be able to tell when it starts to tighten up because you may hear small clanking noises and it will feel like the resistance has increased. 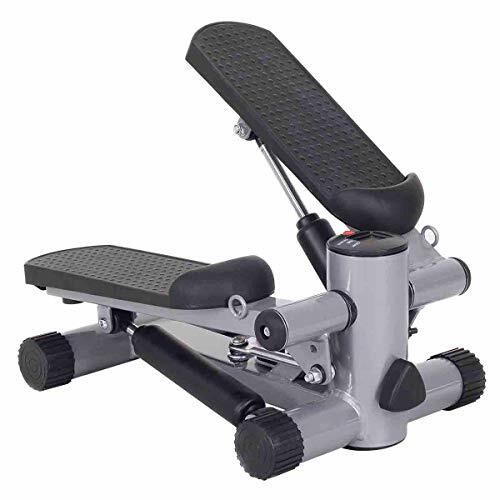 The Goplus climber is a hydraulic resistance climber that adapts hydraulic systems to give you a better workout. The LCD display can help keep track of your exercise and will display the time, rep count, total count, scan, and accumulated calories that are burned. The height of the climber is adjustable and designed to accommodate multiple body types. Two resistance bands can be used while you’re working out. The unit is designed to be very compact, and the dimensions of the machine are 17”x13”x9”. The Goplus stepper is 16 lbs. and can easily support individuals of up to 220 lbs. This climber is designed to be super compact and allows your joints to have a break from any extra pressure. The LCD display is very bright and easy to read, even while you’re working out. The height adjustment accommodates every body type, and the unit can support many body types. There are two different resistance settings, and you can change them based on your progress. Increasing the band resistance can cause you to burn more calories and strengthen your core. The only issue with the climber is that it has a very limited range of motion. Many people expect to be able to have the same range of motion that other stair steppers or bikes have. You may feel around 3/4th to ½ the range of motion that regular types of cardio equipment give you. The best elliptical for small spaces is the iDeer Under Desk Peddler. It’s designed to be used while you’re either standing up or sitting. It can be used in multiple settings and offers you the ability to adjust the resistance to your liking. It’s also designed to be durable, long-lasting, and can accommodate individuals looking to use it for intense workouts. Overall it’s the safest, most convenient option, and it can be used by multiple body types. We’d highly recommend this unit to you if you’re planning on using the unit for both low impact and high impact cardio exercises. Because of its quiet operation, you can even use it in the office.